Messenger RNAs bearing the genetic information for the synthesis of proteins are delivered to defined sites in the cell cytoplasm by molecular motors. 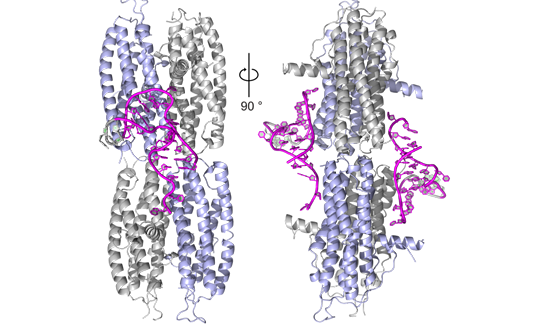 LMU researchers have elucidated how the motors recognize their mRNA freight. Messenger RNAs carry the information for the assembly of proteins from the DNA in the cell nucleus to the sites of protein synthesis in the cytoplasm, and are crucial for cell function. In nerve cells, which form cytoplasmic processes that can be very long, many neuronal mRNAs must be conveyed to the sites of action of their protein products to ensure that the correct intercellular connections can be established. This requires a dedicated transport system that links remote regions of the cytoplasm with the cell nucleus. Dierk Niessing, a professor at LMU’s Biomedical Center and leader of a research group in the Institute of Structural Biology at the Helmholtz Zentrum München, has now characterized the structure of a macromolecular complex involved in the transport of mRNAs in yeast cells. The new findings appear in the journal Nature Structural & Molecular Biology. As a member of the DFG Research Unit “Macromolecular Complexes in mRNA Localization” Niessing explores the workings of the cell’s molecular transport systems in several model organisms. In the new study, carried out in collaboration with first author Franziska Edelmann at the Helmholtz Zentrum München, the authors used baker’s yeast (Saccharomyces cerevisiae) to investigate at high resolution the succession of structural interactions required for the specific recognition of mRNA in the nucleus and its subsequent transport in the cytoplasm. The research team systematically isolated and crystallized sub-complexes of the molecular machine responsible for the process and subjected them to X-ray crystallographic analysis. The resulting models clearly show, for the first time, how the hairpin-like conformation of the RNA is altered when it is recognized by the requisite binding proteins in the nucleus. “We were surprised to see that the RNA is not only recognized by these proteins, they also force it to adopt a new form. They staple it together, so to speak,” Niessing says. Carriage of the RNAs is the responsibility of so-called motor proteins. With the help of unfolded adaptor proteins, they attach to the RNA-protein complex as it emerges from the nucleus. In doing so, they stabilize the whole assembly, as the structural models demonstrate, thus allowing the RNA to be transported to its destination along the fibers that make up the cytoskeleton, which serve as the system’s ‘railway lines’. The new data represent a major advance in our understanding of the transport of RNA – a process that is common to all organisms whose cells are nucleated and is vital for their survival.